As I wander the isles of supermarkets, I look for future post material. 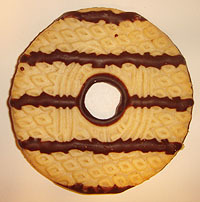 Fudge Stripes have always been on the “to do” list and I forget what was the potential SNS I had lined up was but when I was in a shady mini-mart and saw Robert’s “Fudge Striped” cookies, they made it to the top of the list. We started off with the name brand thinking it would be awesome. These cookies are not amazing. I can see them being popular in gradeschool classrooms or something but found these to be a bit dry and tasteless. 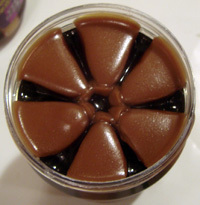 The “fudge” is some sort of platicy, tasteless drizzle with a coating on the bottom. They do have a fair crunch so I’d say what this has going for it is texture over taste. Ethan said these tasted like a crunchy, dry fudgesicle. The same non-chocolatey chocolate stripes the top and covers the bottom. Tie. Both are very bland and use plasticy chocolate. If you’re looking to save money, go with Robert’s Fudge Striped because you won’t be missing and intense flavor or favorable texture experience. I think Girl Scouts sell a similar cookie but I’m not sure. I will definitely check out the offering next time someone from work brings their daughter in to guilt me into buy a few boxes. Fudge Stripes or Fudge Striped? When I was a kid, I used to love Keebler Fudge Stripes. I guess they’re not as good as they used to be. Or maybe I’ve smartened up. Nah. Gotta be the cookie. The Girl Scout Cookies are called Samoas or Caramel deLites (depending on your area) and are “Vanilla cookies coated in caramel, sprinkled with toasted coconut and laced with chocolate strips,” according to wikipedia. i’ve always been a chocolate-covered graham girl, myself. although, i’m disappointed that the fudge stripes didn’t pass the test. I guess it’s just nostalgia that makes them taste good. Keebler cookies have magic. Generic cookies contain no music. Mother’s cookies had (has?) a version too. The Keebler was disappointing. I’m not sure there *is* a good commercial version of this cookie type. Dollar Tree store used to have these delicious, mouth watering cookies that were similar. They may still have them. They were a delicious, extra-thick graham cracker, with a good chocolate coating (just a tad waxy, not bad though, good chocolate taste. They had a hint of cinnamon and a deep honey essence. Only a buck a tray (clear, blue plastic pkg), what a great way to spend $1.00. Rivaled the ‘big’ companies’ cookies in quality for sure! I *think* they were just called “Fudge-covered grahams”. Oops…may have mistated the pkg. coloring on the Dollar Tree Fudge-covered Graham Cookies…it may have been dark brown with red, but now I’m not sure. I HAVE seen a NEW brand there, however that I HAVE NOT TRIED, so hopefully they haven’t discontinued the old ones! NOTE: The new company is NOT safe for people with nut allergies! The old company WAS safe. ALWAYS CALL the company and ask to speak with the person who can answer questions about allergens in their products! These cookies will NOT dissappoint!) Also, Dollar Tree has a few other cookies from this company’s line of products. If you buy some that are NOT delicious…you’ve bought another brand! Where can I buy Fudge Striped (Roberts) in the New York area? Keebler’s is the only kind they have around here. The kind that the Girl Scouts sell is called Caramel Delights. Not very good material for a rematch. 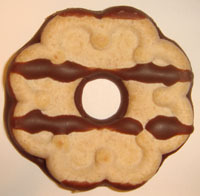 I know this is going to sound weird, but those Robert’s Fudge Striped Cookies were like my favorite cookies in this world as a kid and then I couldn’t find them anywhere anymore. They used to sell them in Super Fresh and I just want to know what stores sell them because honestly, the Keebler ones and all the copy cats aren’t as good to me as Robert’s.